This is the simplest of recipes; I wouldn’t even call it a recipe. 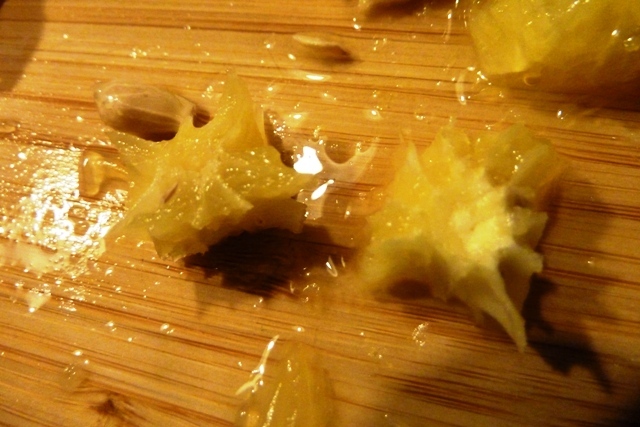 It is mainly a tip for cutting up oranges to put into fruit salad that you may already practice. But I can imagine that beginning cooks might have not discovered this easy method, illustrated below. Basically it involves taking an orange, slicing it horizontally into 3 or four circular slices, then eliminating the middle fleshy part where all the segment skins join together. That leaves you with nice juicy sections that can mix with other fruits for flavoring. We purchased a bushel of Florida oranges this past December from a great nephew who’s a high school band student, and I’m having trouble using them up, mainly because we didn’t quite have the Christmas we planned and I didn’t give away as many as I thought I would to my daughters, etc. So I’ve been making a lot of fruit salad (it goes particularly well to top off a “pancakes for dinner” meal like we had on Shrove Tuesday). Or anytime you have a heavier meal but want to grace it with something sweet, this fills the bill. But at get togethers with certain friends, I have been asked to “bring your fruit salad” so I guess you could call it a recipe if people like it that much. In the 50s and 60s, our Mennonite mothers would make red Jello fruit salad using canned fruit cocktail for another easy dessert. I know some families who had a Jello salad for almost every dinner–and certainly for any company dinner! It was a thing. My kids were never fans of any Jello salad or even plain canned fruit cocktail but they did enjoy fresh fruit salad. Funny how habits and customs change over time and in families. The Bible is certainly full of references to fruit and comparing the benefits of following Christ to simple and glorious fruit. Add any other of your favorite fruits you have on hand: fresh pineapple, apples, tangerines, blueberries or raspberries. In summer, I add cantaloupe, watermelon, or honeydew melons. 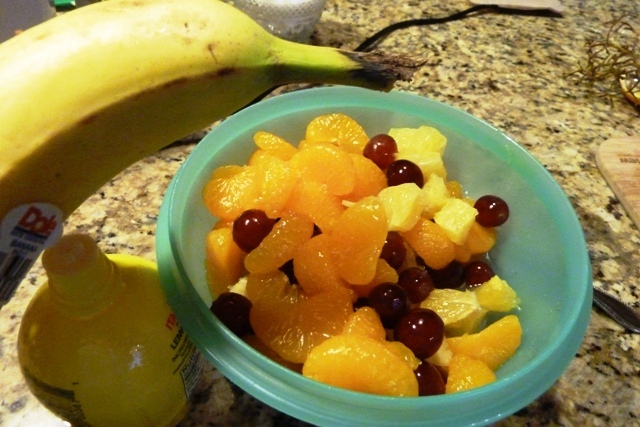 Add banana right before serving if possible, and squirt with some lemon juice to keep some fruits from turning brown. Slice peeled orange horizontally into about four rounds of the orange. Then cut off sections of orange to get rid of the round seedy center. 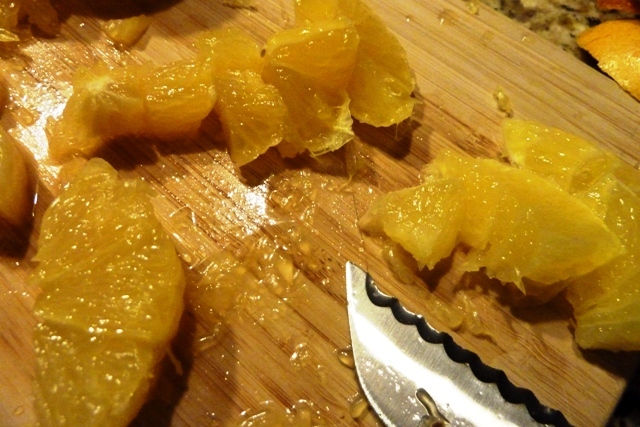 Cut good orange pieces away from center where the segment partitions meet. Throw these fleshy centers away or eat them if you wish, but don’t put into salad, especially if small children are eating the fruit salad. What you have left are the good parts. Chop into smaller bites. 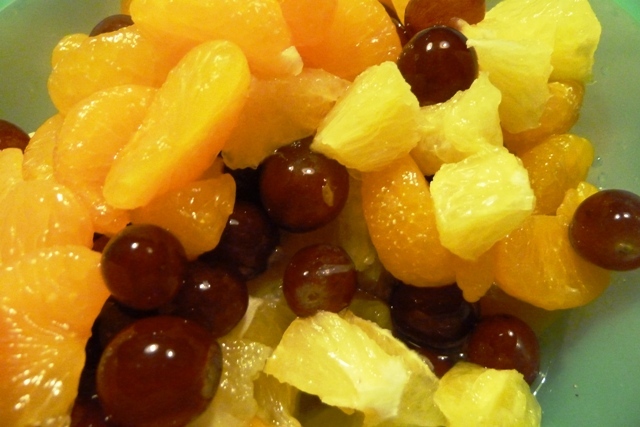 Lightly mix grapes, orange pieces, and mandarin oranges in bowl. Slice banana and add just before serving; use about 1 teaspoon of lemon juice (fresh or bottled) to keep bananas or apples from turning brown. That’s a simple and healthy dessert! For us, it often hits the spot. So, did you grow up having Jello salad frequently? Good memories or not so much? Do you have a better method of cutting up oranges? Esther Shank’s Mennonite Country-Style Recipes and Kitchen Secrets is full of great tips like these that she prepared especially for her own daughters, which has gone on to be a continuing great-selling book. Order here. 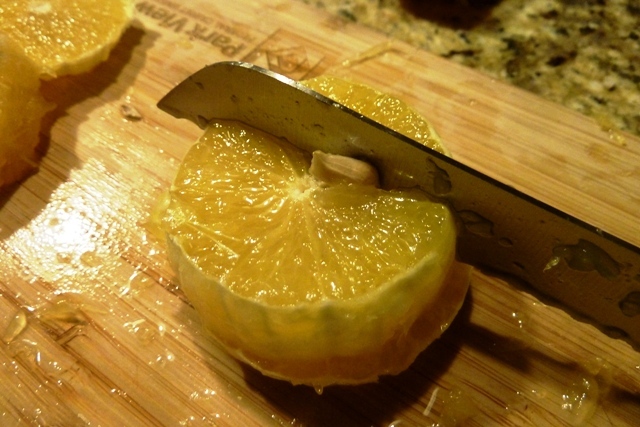 Last evening I ate a navel orange with thick rind, using a knife to remove it in a horizontal motion. Then I just separated the sections and popped them into my mouth. If I need to make a fruit salad, I’ll try your method. I would love a sweet navel fresh Florida orange about now. Are you near any orange groves? Thanks for your tip too! Most of the groves are south of here near Orlando. Oh, I remember the salads made with jello..actually fond memories. For many years when I was growing up our Sunday lunch would consist of grilled cheese sandwiches, butterscotch pudding (sometimes tapioca pudding), and jello with fruit cocktail in it! There was also an assortment of congealed salads (as they call them here in KY). I had a whole recipe book put out by Jello, but sadly I got rid of it over the years. In later years my mother made a fresh fruit salad that looks much like yours. Tapioca is my favorite pudding so I make that every two to three weeks. I like the long cooking kind, not the instant. Elaine, thanks for sharing your fond Jello memories–I loved it as a child, too. As a Mom I can certainly appreciate the simplicity of having that kind of Sunday lunch, particularly if it was one that the kids loved! Yes, I have commented a few times in the past. I grew up BIC, but am now a Presbyterian so you and I have a couple things in common. We moved to KY (via FL) to retire near our daughter. We both are originally from eastern PA. I really enjoyed the book “Blush” as it brought many of my childhood memories as a “plain” girl. I suppose you are more Presbyterian (lol), but we never leave our Anabaptist up bringing. It is deeply ingrained in our values, something for which I am very thankful for. So nice chatting with you! No problem on delay–I always enjoyed going to Lexington while we lived in the area around Hazard–it seemed like a real “city” and likely even more so today, I’m sure. I have heard of Jackson, KY. You are so correct that we never leave our Anabaptist upbringing–my husband has said “you can take her out of the Mennonite church but you won’t take the Mennonite out of her.” In working as I have for the Mennonite church all these years, I suppose when I retire I will experience that “departure” from the church of my heritage in a new way and. We’ll see! It will be ok. Likewise, thanks for the chat.